I have a fondness for certain foods. I don't think they are used often enough in the average American diet and because I am usually a champion of the underdog, I will try and come up with an exceptional recipe using these foods. On that list is my personal favorite, the rhubarb plant. Rhubarb is gaining in popularity once again and for good reason. Once established it is hardy, and produces food for you, year after year, just like a good friend. Rhubarb is also easy to grow, or some would have you believe. Not me, however. I have struggled for the last 5 years (or more, some of these plants came from another home of mine...) to get this rhubarb bed going. But I must confess, the green thumb in this family belongs to my dear husband. I prefer crimson rhubarb because it is pretty. In the garden and in any recipe once cooked. But never you mind all that, if I am offered green stick rhubarb cooked up in any recipe, I will enjoy every bite of it. Rhubarb pairs well with many other foods, making it a natural for any home gardener. 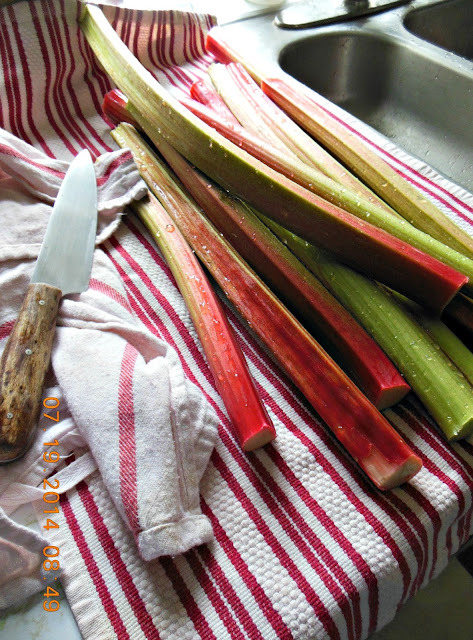 One recipe I return to time and time again is this poached rhubarb. The recipe is offered with a range of sugar, so that you may make this and use it for different serving needs. When served as a poached fruit, I use the smaller amount of sugar. Cooked this way rhubarb makes a wonderful breakfast along with a slice of toast and a spoonful of vanilla yogurt. As a dessert sauce or the actual dessert itself, I use the full amount of sugar listed. Keep in mind that rhubarb is tart, and that tartness won't be covered over with sugar, the sugar will enhance the tart flavor deliciously! I hope you enjoy this as much as I do. This is made a couple of times a month in our kitchen. While I call this poached, this original source calls the method steamed, and it is, with nothing added during the initial process. This is a very easy recipe, mostly hands-free (no stirring) and really delicious! When the rhubarb is tender, combine the sugar, soda, salt and boiling water. Stir until dissolved, gently pour over the steamed rhubarb. Cover and steam an addition 2-3 minutes. Carefully pour or spoon cooked rhubarb into a serving bowl, and let cool completely. Makes approximately 1 quart of poached rhubarb. Which is wonderful over Gingerbread, especially from Miss Edna Lewis! Your Rhubarb looks wonderful, I don't get that much here I think it is just to hot for it.Thanks so much for sharing your post with us at Full Plate Thursday this week. Hope you will come back and visit us again real soon!